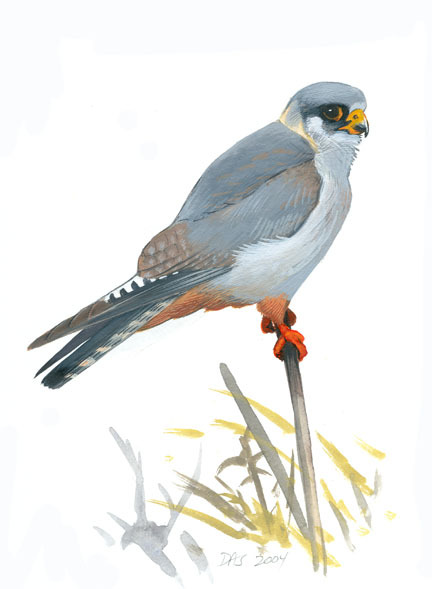 Illustration of the Red-footed Falcon perched. The smooth gray color is unlike any North American Falcon. Old juvenal wing and tail feathers are slightly brownish and barred, while adult feathers will be uniform blackish. Juvenal feathers are obvious on the outer tail, the primaries (molt reveals the boldly barred inner web of one outer primary), the brownish and faintly barred tertials and secondaries, and some brownish wing coverts. The pale cheeks, small dark “mustache”, and buffy nape are also immature features. All of these things show that the bird is in its “first summer”, born in 2003 just over one year ago. The first North American (and New World) record of Red-footed Falcon was seen in 2004 on a small airstrip managed by the Nature Conservancy on Martha’s Vineyard, Massachusetts. First discovered on August 8th by Vernon Laux, conclusively identified on August 10th by Jeremiah Trimble, and seen daily (still present as of August 16th). For more information about the bird and how to see it go to www.massbird.org. In the justifiable excitement over the appearance of this fantastic little falcon in Massachusetts, there has been relatively little discussion of its identification. While the bird is relatively easy to separate from all other North American and European falcons, there is a closely-related species from Asia, the Amur Falcon, which could easily wander to North America (maybe “easily” is the wrong word, but I think it’s only a little less likely than Red-footed in Massachusetts). There is no doubt that the Martha’s Vineyard bird is a Red-footed Falcon, but individual observers will still want to know how the bird was identified, and will want to satisfy themselves that they are looking at a Red-footed Falcon. The key feature used to separate adult male (Western) Red-footed Falcon (Falco vespertinus) from the closely related Amur Falcon (Falco amurensis) is the color of the underwing coverts. These are all gray in adult Red-footed and all white in adult Amur. Unfortunately juvenile males of both species have barred underwing coverts until about 1 year of age and the Martha’s Vineyard bird has just begun to molt those feathers. Many 1st summer male Red-footed Falcons are farther along in their molt by this date, and have the underwing coverts mostly gray, but this is not the case here, and the underwing coverts are still almost entirely juvenal feathers. Furthermore, the typical views of the Martha’s Vineyard bird – against a bright hazy sky and in brief, low, erratic flights – make it very difficult to obtain a clear view of the underwing coverts. On 11 August 2004 I spent six hours watching the bird and intently trying to see any diagnostic feathers on the underwing. This was a very frustrating exercise since, depending on the lighting, the underwing coverts could look uniform dark gray or pale buffy-white with fine barring. Photographs by Jeremiah Trimble, Peter Alden and others reveal that there are a few gray feathers there and in retrospect I think I did see this in the field several times, but I think observers who want to convince themselves in the field that they are seeing the gray feathers of a Red-footed Falcon will need to have very good views of the underwing coverts. 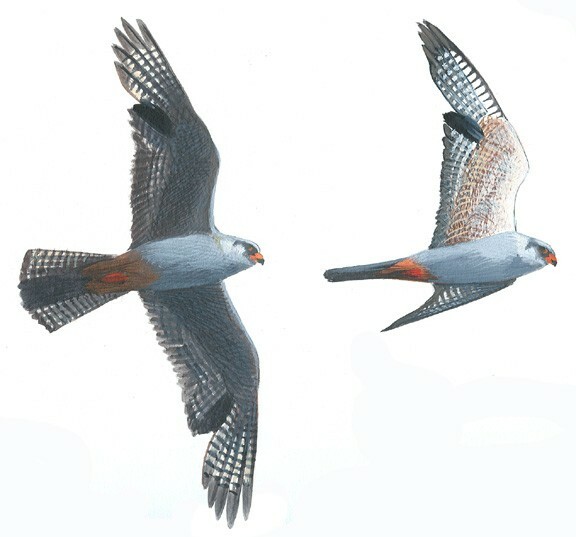 Illustration showing the Martha’s Vineyard Red-footed Falcon in flight with the underwing coverts in shadow (left) and in sunlight (right). Both of these views are misleading. I’ve hinted at the few gray middle coverts in the brightly-lit illustration on the right, but I believe that the bright light washes out the gray so that it blends in with the surrounding barred feathers. Presumably, if the bird was an Amur Falcon and these incoming feathers were white, they would be more conspicuous among the barred coverts. However the generally blotchy, molting appearance and the normal shadows and contours of the feather tracts make these few small feathers very difficult to pick out. In flight the two incoming blackish adult primaries are obvious around the middle of the wing. On adult males the upperside of the tail is darker than the back in Red-footed, and about the same shade of gray as the back in Amur. The Martha’s Vineyard bird has molted about four central tail feathers and these new adult feathers are distinctly darker than the back: slaty-blackish with a slightly darker band at the tip, correct for Red-footed. 1st summer male Red-footed show smudges of pale reddish brown within the gray breast, while Amur lacks this reddish color and usually shows broad dark streaks on the belly. The Martha’s Vineyard bird shows some small patches of reddish brown on the breast, and only very fine dark streaks on the flank feathers. This can be difficult to see in the field. Juvenile male Red-footed Falcons usually have the barring on the underwing coverts reddish brown, while on Amur the barring is usually blackish. There is apparently some overlap in color, but the Martha’s Vineyard bird clearly has reddish-brown barring on the underwing coverts, and this is visible in the field whenever the underwing coverts are well-lit. Ferguson-Lees and Christie (2001. Raptors: Birds of Prey of the World) report that the wingtips of Red-footed reach or exceed the tail tip when perched, while on Amur the wingtips fall just short of the tail tip. The Martha’s Vineyard bird in my view showed wingtips just about equal to the tail tip, sometimes looking slightly shorter or minutely longer, depending on the angle, but another observer reports that the wingtips looked consistently shorter than the tail. Obviously this is tricky to ascertain, and adults and juveniles may have different proportions. The illustration in the Handbook of Birds of the World (volume 2. 1994) shows the Amur falcon with white along the bend of the wing when perched. This may be a distinction from the gray of adult Red-footed, but not immatures, as the Martha’s Vineyard bird shows a white edge there as well, and often reveals a few bright white feathers at the bend of the wing when preening or stretching.